Getting banned from coffee shops and local eateries is normally an action reserved for jefbot’s sister, Xinda, but it’s probably best jefbot’s obsession with the baristas saying his name ended before it got seriously out of control. very true, StephenKaze! it seems the baristas have won, yet didn’t even know they were playing. I’ve been banned for the contents, but never the cup itself. Bot just tries so hard, I feel really sorry for him. I wouldn’t have this problem myself, I only drink tea, and I just buy teabags from the supermarket and make my own. i used to drink a ton of tea, Tyrone, but switched to coffee somewhere along the way. thinking about going back to tea, though; i’ve become somewhat obsessed with coffee lately, and it’s making me nervous. The baristas see you comin’ they hatin’. I was wondering why your picture wasn’t showing. I think “never ask for it again” is the more accurate statement. I don’t know if that would work where I live, mainly because I know that several of my friends who work in places like this would probably complement your artistry rather than ban you. That I’m sure they sell cups like that somewhere. ….but… but… customized refillable coffee cups save the environment! yep! i’ve seen ’em at Starbucks, and on Amazon, even. Awww, poor jefbot was just trying to express himself. Damn baristas. Joke away shuga dahlin! Sometime La Pixie has to clarify things in her scattered brain. No one is judging you. As long as you don’t quote anything by Christian Bale. Or as I like to call him..Why is he famous?! SO not impressed by anything he’s done…and I do mean ANYTHING! i think my favorite movie Christian Bale’s done is Empire of the Sun, Pixie! but that was like, almost 25 years ago!? yeah, those baristas are stifling bot’s creativity, Maddgodd81!!! Most of the baristas I know are pretty cool and would laugh at the Cthulhus or squid monsters or whatever those things are. But maybe they’re different in LA? My goodness Exhaulted One…what did you draw on the cup?! And just for the record, I am all for the refillable cups for both coffee and iced drinks. Not that I’m all no bathing and patchouli or hippy riffic. Its more of a “doing my part” one thing at a time. Refillable cups can also sometimes save you money i the long run. Also, did you see my link about the musketeers, Pixie? Yes Fijiman I didn’t even think about the fact that you can sometimes get refills for next to nothing. Yes I did get your link and I did check it out. I had more the Three Musketeers by Alexander Dumas in mind. And again, we shall probably never know why he chose that title. and yeah, i need to start using those refillable tumblers as i do make a lot of trash by getting new cups every time i go to the coffee shop. i’ll check ’em out next time i’m there. There is no justice! Come on JB let’s get our revenge by teepeeing the entire coffeehouse! Maybe even throw in a truck full of rotten eggs! That’ll teach em to ban our dear Bot! they do make those cups for sale, ZAD-Man! (well, not with the drawings jefbot made on his, of course. heheh.) Starbucks even has the templates online so you can use your computer to create the artwork. maybe i should buy some of those cups, re-create the artwork, put it on the cups, and sell ’em in the BOTshop! You scared them with the Elder God, eh? I wish I had a Jefbot customized cup, too! You should offer them in your store… speaking of which (you knew this was coming), when will it be up? you beat me to that thought (about making some customized coffee cups), shanna! ….I’m sort of a Cel Fanboy…. Jeff… the evil hoard of followers you got DEMAND a close up of the coffee cup!!!! We need to judge the degree of FEARNESS that the cup portraits to properly determine if the baristas you frequent are nothing but a bunch of crybabies or not (pretty sure if the former). I still WANT coffee. My doctors HATE me! When I rule this punny planet my revenge will be BLOODY!!!! I like the smell of coffee. Dislike the taste very much. Agreed. I’m no fan of coffee either. Same here. It’s an acquired taste that I simply never acquired. It’s all about how you fix it. I hate black coffee. But will drink espresso (high sugar or sweetner content). As for my normal every day coffee, Bustello with sugar and creamer (carmel machiato (that is spelled so wrong…)) or just plain milk. As for my frou frou coffee, I like mochaa or carmel thingies I mentioned before. Why? because they are sweet and creamy. Then again, being raised in a Puerto Rican household, coffee is almost part of tradition. When people come over you make coffee and serve pan con mantequilla. (Bread and Butter) It’s jus part of la visitas (visiting). Heck I’ve been drinking super light coffee since I was little. I like it a little stonger now. agreed, Pixie. although my entire family for the most part drinks coffee black, i just can’t do it. too bitter and tastes nasty. but throw some cream and sugar in there, and maybe some mocha and caramel, and now you’ve got something worth drinking! Maybe you should boil them in coffee before you kill them. Seriously? They can do that? my sister (Linda/Xinda, of course) has been banned from at least one coffee shop that i know of, Maryz (which might get referenced in the next strip, actually). so yeah: they can definitely ban people. Long ago I learned to make all my favorite drinks myself. Smoothies, Frappuccinos, even some of the not so legal if you’re under 21 varieties of drinks. Also, and this is just a thought. Try bringing in a mug shaped like a hollowed out skull! Your local baristas will love you! Or they’ll just do what they did to Jefbot. I don’t always get banned from restaurants, but when I do, I do it with style. True. If you are going to get kicked out/banned from some place, you should at least make it worth getting banned instead of getting banned for some stupid reason like decorating your refillable cup. Not that I would condone purposely doing things to get banned. i hope when we meet one day, that we can drink Crystal Head vodka from your collection of skull-based glasses, Pixie. Bahahahahaha!!!! The ban hammer strikes again! jefbot shall have his revenge, TCG! maybe not for another year or two, but someday he’ll be back! Don’t feel too bad, bot. If it’s any consolation, you’ve probably given the barista nightmares for the rest of his life. It’s a small victory. I HEAR good things about Coffee Bean and Tea Leaf! i believe the Coffee Bean and Tea Leaf is actually within closer walking distance to my apartment than the Starbucks, FunnyShaffer. and although i love CB&TL’s honey chip, when i’m in the mood for some flavored espresso, i dig SB more. *WARNING*- Contains vulgar language and insanity; viewer discretion is advised! If that wasn’t staged, then all I have to say is this: Dayum! How is that guy not in an asylum? I’m not sure, but I have a suspicion it’s true. There’s just too many videos, and in some of ’em the reactions just seem very honest. Were those squid head aliens eating where’s Wally? space-zombie/cthulu hybrids chomping on baristas, Af! never deny the sleep ninjas if you can help it BK! and, ooOh – half robot, bloody teddy bear? i approve! You are thinking of Lewis Black. And I believe he said this particular phenomenon occurred in Houston, Texas. i base the coffee shop in the strip on a Starbucks that i frequent within walking distance from my apartment, Kisame. and yes, there’s another Starbucks literally across the street in a Pavilions market! so jefbot still has options and yes, the “chain shall never end.” heheh. I would tear his soul out through his eyes and devour it before him. Well, if Barista’s had souls in the first place. But his spleen would do just fine as a substitute. It would also help if you didn’t rip it out through his eyes. i think i’ve heard it hurts more when you rip it through the eyes, Fijiman. Yeah, but then you don’t have the reward of knowing that the last thing they see is you devouring their soul instead of you hand through their eyes. Panera did this back before they upgraded to pagers. My friends and I (we all worked there) would have our names put in as things like Batman, Captain Awesome, and Milton Bradley. Calling out names for orders, not banning people for bringing in personalized mugs. Srry dude, the last one was from me, don’t know why it didn’t include my name. i blame it on cthulu. very true. and sadly, i often lose without knowing i’m playing, 11TN. BANNED?! What did ‘bot draw on there? I think that barista is just jealous of Bot’s epic drawing skills. it’s too grotesque and terrifying to describe in detail, Stan. maybe someday i’ll provide a high-res, detailed approximation of what was on there. Maybe it was a drawing of that barista being sodimized by one of the other baristas. I’m good at making some people giggle. Everybody else just looks at me funny. Great Strip! You’re a nut off the same tree. It’s his cup. He should be able to do what he wants to. i agree, dchorror! 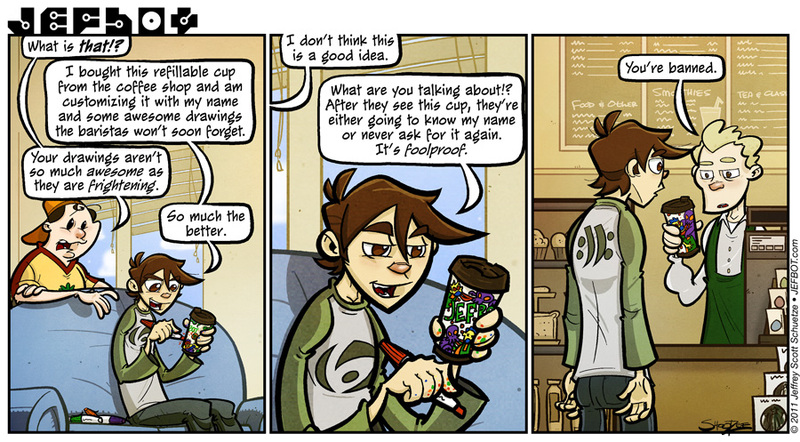 hmm… i wonder if Starbucks has run into any problems with the customizable cups they sell. i might have to google that later. Oh snap. Starbucks – 1 Jefbot – 0 hahahahahaha….love this storyline, bot.